This dish is just a combination of few different vegetables. If you do not have any vegetarian oyster sauce or mushroom sauce, just replace with light soy sauce plus sugar with a bit of cornflour solution and season with pepper or/and granulated mushroom bouillon. Add in 30ml water (adjust the amount of vegetarian oyster sauce) if you prefer more sauce to go with rice. 2. Add the king oyster mushroom, carrot and stir-fry briskly for 1 minute. Throw in the Chinese cabbage, snow peas, baby corn and stir-fry for another 1 -1½ minute. 3. Stir in the vegetarian oyster sauce, pepper and stir-fry briskly. Ahh…, durian soy milk shake now. I have seen this durian milk shake at the popular kiosk selling durian pancake at AMK Hub but never try before. I tried using soy milk to do this, nice! Just don’t add too much durian, it will be too creamy and thick. Ah, Durian Tofu Dessert. Durian is a popular fruit here. I just grab a pack of normal quality durian from the supermarket and make this dessert. 1. Combine all the ingredients in a blender and blend until smooth and creamy. There are so many ways to cook rice. If you are not having enough time and want something simple or maybe you want to be more environmental friendly, this might the thing you are looking for. Just added some sweet potatoes, a little bit of salt to the brown rice. Sushi vinegar and sugar can be added, if desired for a more robust taste. When it is done, you have a bowl of healthy sweet potatoes brown rice top with some raw vegetables like lettuce and cherry tomatoes. After making the strawberry tofu dessert, I decide to try out using mango. This turn out to be like a pudding. So, experiment with different types of fruit to come up a unique tofu dessert. It’s fun. You may opt to replace passion fruit with other fruits, if desired. 2. Serve chilled and top with passion fruit. Mixing tofu and fruit to make a quick and simple dessert. There is no cooking required at all. For those who do not like soy or tofu, this dessert might be suitable for them. The blended tofu’s texture is so creamy just like yogurt and the strawberries lend its sweet taste and freshness to make it so delectable. A great healthy dessert for kids who do not like fruit. Strawberries bits can be added, if desired. 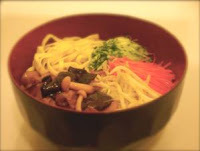 Again, this is a very quick and simple dish which everyone can do. You can replace spices salt with curry powder with pinch of salt added or just salt and pepper. It is a delectable dish. 1. Brush some oil and spices salt on the mushroom slices. 2. Grease a baking tray with oil and place the mushroom slices on it. Toast or bake for 10 minutes or until it is golden yellow. Turn them over halfway. This is another way to cook tofu or beancurd. If you consume garlic or shallot, you can get these “heat-up” curry tofu cubes from the supermarket. Otherwise, you can whip it up, it is rather simple. Substitute curry leaves with lemongrass, if desired or totally omit them if you could not get these herbs. ° 1 firm tofu/beancurd (225g), pat dry, cubes and deep-fried/pan-fried. 3. Throw in the tofu, water, coconut milk and bring to a boil. Season to taste with salt and sugar. 4. Simmer for 5-8 minutes or until the gravy is slightly dry. Wolfberries have antioxidant qualities, nourish the yin, strengthen the eyes, and help support the kidneys, liver and blood. It is commonly use in Traditional Herbal Soup. I added wolfberries to the brown rice, to make it more nutritious. For each bowl of rice, I add 1 teaspoon of wolfberries, you may add more, if desired. Nothing too difficult, throw in the wolfberries when washing the rice and the rest is as per normal way of cooking rice. This is a simple way of cooking firm tofu or beancurd. If silken tofu is used, the water in it must be drained and coated with some corn starch prior to deep-frying. You can either choose to cut the tofu into small cubes prior to deep-frying, if prefer. The deep-fried tofu goes well with various dipping sauce, like light soy sauce, light soy sauce with chilli, chilli or tomatoes sauce, teriyaki sauce etc. 1. Heat oil in a deep-fryer or wok over high heat or until a cube of bread dropped into the oil brown in few seconds. 2. Deep fry the beancurd until golden yellow. Remove, drain on kitchen paper and leave to cool. 3. Cut the tofu into smaller square. 4. Serves with light soy sauce with chilli or chilli sauce. If you are tire of cooking, you might want to have a light and simple salad like this. To make it more colourful, just add some cherry tomatoes and sprinkle some sesame seeds. 1. Combine all the salad cream ingredients in a bowl and mix well. 2. Mix all the shredded vegetable in a bowl and pour the salad cream over. I didn’t know that minty mayonnaise can be so nice and refreshing until I had a chance to have it at one of the Vegetarian eateries here. So, I decide to make this using Su Xian Zi brand (www.suxianzi.com) salad cream which is suitable for vegan and vegetarian. As for the peppermint flavoured syrup I used the type that is for Bubble Tea. As the mint syrup contains sugar, therefore, I didn’t add any sugar in the ingredient. This is a simple, light and easy to cook soup. Crab mushroom or buna shimeji mushroom can be added if desired. To make it more interesting, serve this soup differently. 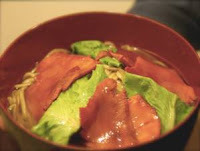 Adding red dates are to make the soup sweet and balance the "coolness" of the "Yin" vegetable soup. Omit red dates, if desired. Ginger warmths is able to balance off the "coolness" of the vegetables. 1. Place the marrow green, carrot, mushrooms, red dates, ginger and water in a pot. Bring to a boil and simmer for 15 minutes or until the marrow green is soft. 2. Season to taste with olive oil, salt, pepper and granulated mushroom bouillon. 3. Garnish with spring onion or coriander and serve hot. Quite a common dish that you can find at the vegetarian stalls. Usually they will add vegetarian ham or vegetarian hotdog to this dish. Nothing difficult at all, you may want to give it a try. It goes well with rice and kids love it. You can even steam the potatoes and later mix in with the bake bean, if desired. 2. Add the potatoes and stir-fry for 5 – 8 minutes or until the potatoes are tender. 3. Stir in the baked bean and bring to a boil. 4. Transfer to a serving dish and garnish with spring onion or coriander and serve immediately.